Curly Full Lace Wigs Q&A: What's the best moisturizer for curly hair lace wigs? How Do You Moisturize Curly Full Lace Wigs? "How are you supposed to moisturize curly full lace wigs?" Caring for curly full lace wigs isn't that much different than caring for other textures of hair - but there are a few steps you can take to take care of the curls and keep your human hair curly wig looking great. We find it's easiest to think about maintaining curly lace wigs (actually all human hair wigs and human hair extensions for that matter) as three different areas; daily styling, washing and deep conditioning. Right now however, we'll focus on the daily elements of caring for your curly lace wig in terms of moisturizing, combing and styling. Essentially your curly human hair wig should be moisturized every day. You can use serum, cream (or what some like to call a crème) or you can use a spray moisturizer. "Hmm, what exactly is a water based moisturizer?" we hear you ask. The answer is, the primary (or first) ingredient. Check the ingredients on your hair care moisturizer, if the first ingredient is water, then your product is water based; if the first ingredient is oil, then it's oil based. Both types of moisturizers will contain other ingredients that are similar such as humectants (which help the hair draw in and trap moisture from the air) and emollients that soften the hair. A water based moisturizer will ensure that the curly hair receives the moisture (water ) it needs; oils can be added at any time but oils don't provide moisture, they provide proteins or lubrication or both (if you choose the right oil). "What can you use as a quick fix of moisture for curly hair wigs?" 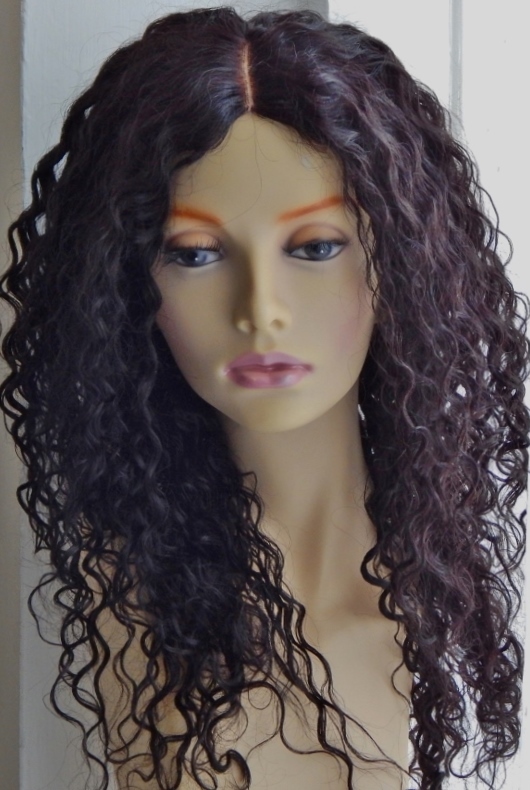 Curly full lace wigs can sometimes be prone to drying out due to the fact that the hair has been chemically processed to produce the curly hair texture. As a quick and temporary fix, fill a spray pump full of 90% water and 10% glycerine and mist your hair or, just use if the ends of the hair are becoming frizzy or becoming dry. "Is Vaseline OK to use to smooth curly hair wigs?" Some people use Vaseline (petroleum jelly) on the ends of the hair to smooth it. The general view from us is that mineral oil (or products that contain it) should not really be used on hair - if the hair on your curly full lace wig has dry or frizzy ends, there are better oils that can smooth hair and provide nourishment at the same time. The main objection to mineral oil as an all-over-hair product is that it simply coats the hair - yes it makes hair smooth and yes it makes hair shiny, but mineral oil also prevents moisture from penetrating the hair shaft which causes dryness, brittleness and breakage. As mineral oil only sits on the surface of hair (it cannot be absorbed by the hair) it also has the wonderfully annoying, unwanted use of trapping dust and dirt - massive thumbs down - boo, hiss! As we don't want to encourage hate mail from the petroleum jelly advocates we'll also state that most oils are fine for hair, it just depends on what you hope to gain by using them and how they are used. If you want an oil that sits on the surface of the hair in order to smooth it, then mineral oil and jojoba oil are apt for this; but if you want an oil that can be absorbed by the hair, then mineral oil and jojoba oil are not the best choices.